Wait, Did F1 Driver Daniel Ricciardo’s Parents Help Fake Finding That 131 Year Old Message In A Bottle? 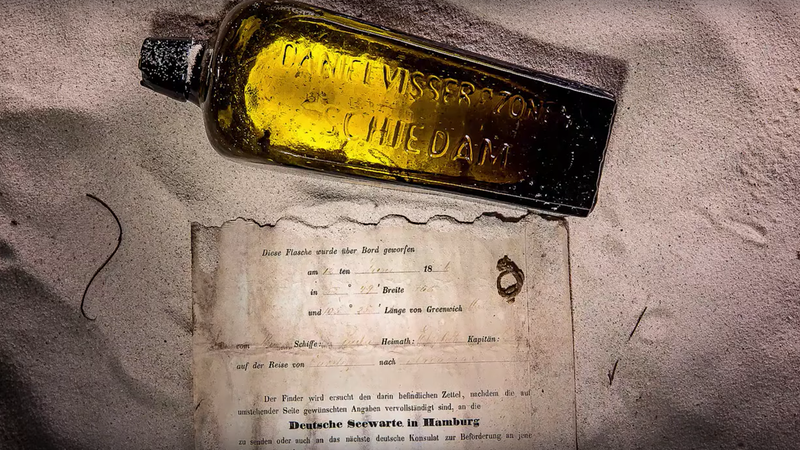 While driving on an island in Western Australia, WAtoday reports that Formula One driver Daniel Ricciardo’s parents and their friends claim they found a 132-year-old message in a bottle they originally thought was litter. But not everyone believes them, and some think it’s just an elaborate marketing plan. Joe and Grace Ricciardo were on a Wedge Island beach with a group of friends on Jan. 21, including Tonya and Kym Illman. Tonya Illman said she found the bottle and decided she wanted to take it home to put on her bookshelf, but later noticed a note was inside. Tonya said in a statement online that the note was too wet to take out of the bottle at the time, so they took it home and put it over an oven to dry it out before doing anything else. The Illmans eventually pulled the note out and saw that it was written in faint German writing, and translated it before deciding it must have come from a ship in the 1800s. It’s believed to be one of thousands of bottle messages thrown overboard by the German Naval Observatory while studying ocean currents. Agencies backed up that conclusion afterward, and said it was the world’s oldest message in a bottle finding at nearly 132 years. It’s believed that the bottle was sent overboard in 1886, and it’s already been given the Guinness World Record—replacing the last bottle by a couple of decades. Paula’s original meteorological logbook held by the German Weather Service contained an entry recording the throwing of a bottle overboard on June 12, 1886 at the exact co-ordinates on the note while on a voyage from Cardiff to Macassar. The German Maritime and Hydrographic Agency confirmed the type of message, wording and printing layout on the note were identical to comparable examples of messages held in their archives for 1886. WA Museum conservators said the paper fabric and coloration appears consistent with cheaply-made 19th century paper. But not everyone is on board with the finding, since WAtoday reports that Kym Illman is a known businessperson and “ambush marketer” in the Perth area. Radio hosts said some people think the Illmans’ discovery could be an elaborate marketing scheme for Wedge Island, and Perth Now reports that Kym Illman admitted people would have probably expected the old message to be in much worse shape than it was in after more than a century and time at sea. It’s understandable that people would worry about the marketing aspect behind the finding, since Kym Illman is a professional at this type of thing: His website has a digital story outlining the message and the steps they went through to verify it with photos, video, a story and quotes. It’s all incredibly well done. “Now we discovered this on the 21st January - there’s not a day that goes by that we don’t look at each other and just laugh and say this is unbelievable and ... we were part of it,” he said. “If I’ve shonky-ed this up, I’m even better than I think I am,” [Kym Illman] said. “To get access to the name of the boat, where it was on a certain day - because it’s not online anywhere - you’d have to go into the annals in Germany, get the information, find a bottle of that vintage and put it up there, wrap a note so that the indent of the rope is visible. Museum assistant curator of maritime archaeology Ross Anderson said he was surprised the bottle and message were in such good condition. Anderson said the bottle must have come ashore six to 12 months after being dropped overboard and stayed buried in the sand, with the tight rolling of the paper helping preserve it, according to Perth Now. Kym Illman also told WAtoday that museum experts said the only way the note could’ve survived was if it was out of the elements and sun all of these years. “We’ve done as much as we can to corroborate the find,” Mr Anderson told AAP. “On the walk, Tonya happens to walk past the bottle and says ‘there’s rubbish on the beach, lets pick up something’. “She picks up the bottle, has a look at it, gives it to Bree back at the car.. it’s Bree who shakes out the bottle and finds the note. “Now that could have quite easily been Grace Ricciardo being first and picking it up, it could have quite easily been nobody picking it up. “I’d like to suggest I’m a clever guy ... but I can’t possibly pull the wool over two German national agencies, the WA Musuem, the Ricciardos and my son’s girlfriend. There’s no word on whether Daniel Ricciardo’s newest post-race F1 celebration will be to drink from a centuries-old bottle instead of his sweaty shoe.